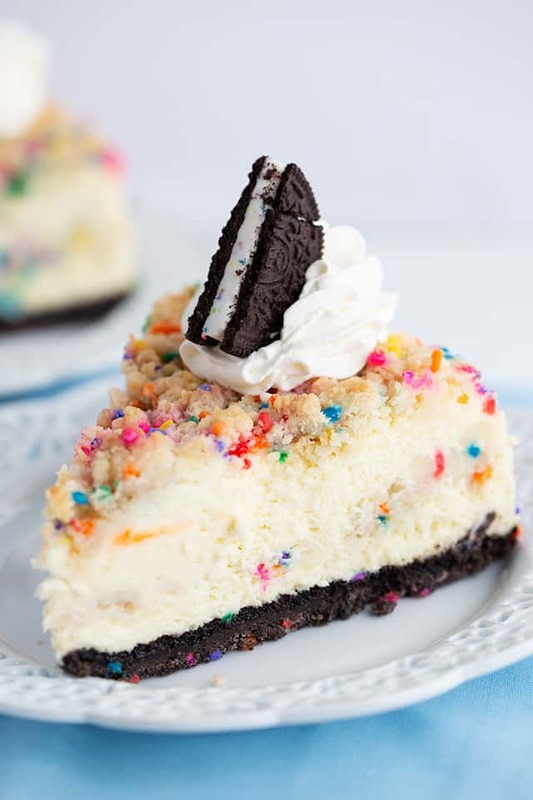 This birthday cheesecake is packed full of flavor! 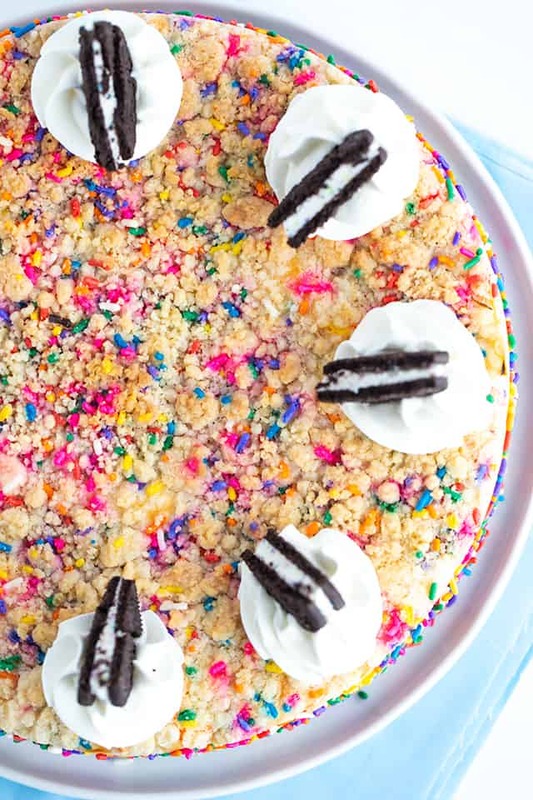 It has a birthday cake Oreo cookie crust, a cheesecake batter with a cake batter extract and bits of sugar cookie dough in it. The top has a golden brown sugar cookie crumble. 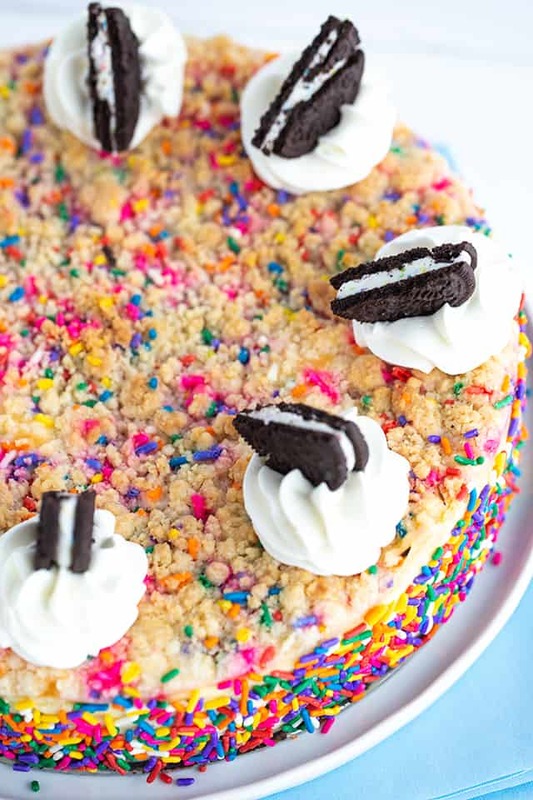 It makes a beautiful sprinkle wrapped birthday cake cheesecake for any cheesecake lover. I initially made this birthday cheesecake for Cookie Dough and Oven Mitt’s 2nd blogiversary. I think these next two sentences still hold true. The magic is in the sprinkles. There also might be a little spark in those super amazing birthday cake Oreos too. I’m a sucker for cheesecake as you may have noticed by all of the cheesecake recipes. This one is a little different. 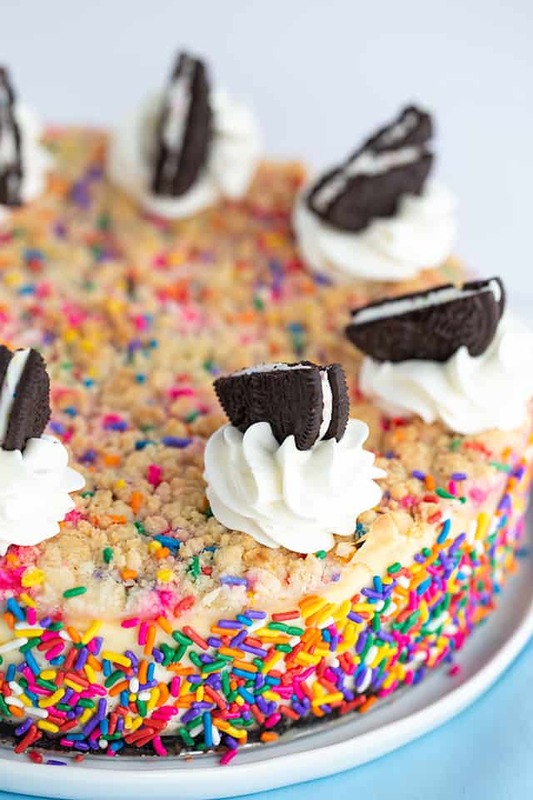 It has bits of sugar cookie dough throughout the inside of the cheesecake, birthday cake Oreos as the crust, and it’s wrapped in festive sprinkles. That tricky candle in the picture above had me going crazy. I huffed and puffed and thought I had it out. I would hear a crackle and it would be lit again. Now, I was pretty sure I bought normal candles, but who knows. After nearly catching my eyebrows on fire, I decided to run it under water. That’s the trick to putting those babies out. This is seriously a pretty darn awesome birthday cheesecake. 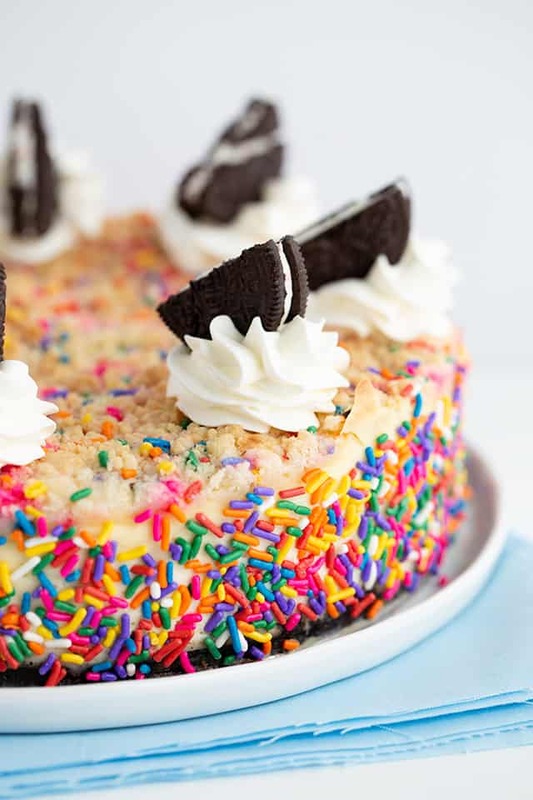 It’s for the cheesecake, Oreo, cookie dough, and sprinkle lovers. Anyone you make this for is bound to like one of those things, right? There are two ways to prepare an Oreo Cookie Crust. You can either bake the crust or freeze it. I typically don’t have room in my freezer, so I usually always bake it. I’ll talk about both ways and you can pick your way. For my oreo cookie crust recipe, I used birthday cake Oreos and butter. For a fine crumb to form, it’s best to process the cookies in a food processor. Smashing the cookies in a storage bag always leaves most of the filling stuck to the sides of the storage bag. Drizzle the melted butter on top of the fine oreo cookie crumbs while it’s still in the food processor. Pulse the crumbs a few times so all of the crumbs are coated with butter. For a little extra pop of color, I stirred in some of my rainbow sprinkles. Don’t pulse after you add the sprinkles. Press the crumbs into the springform pan. At this point, you can either bake the crust for 10 minutes or freeze for at least 15 minutes. I’ve had people comment that baking the crust makes it hard and they prefer to freeze it. I don’t mind it being baked and never have a problem with it being too hard. Freezing the crust will allow it to be firm enough to pour the batter into it without pulling up crumbs. Before you get started on the birthday cheesecake batter, we have to make the sugar cookie crumb. You can make this ahead of time and keep it in the freezer until you want to bake off the cheesecake. To make the sugar cookie crumb, add the butter and sugar in a mixing bowl and beat until creamy. Add in the vanilla extract, heavy cream (or milk), and flour. At first the sugar cookie dough will be super crumbly, just keep mixing it until it starts to clump together slightly. It DOESN’T need to come together like cookie dough. Crumbly is good. Stir the rainbow sprinkles into the sugar cookie crumbs. Put the sugar cookie crumbs in a storage bag and pop into the freezer for about an hour or until they’re firm. To make the birthday cheesecake recipe start by adding the cream cheese and sugar into a large mixing bowl. Beat until smooth. Scrape down the sides of the bowl every step of the way to avoid lumpy cheesecake. Add in the vanilla extract, cake batter extract, and the eggs one at a time. Scrape down the sides and bottom of the bowl after adding each egg. It’s important to remember to beat in the eggs just until they’re combined. Overmixing the eggs will change the texture of your birthday cheesecake. Add in the sour cream and heavy cream and beat until incorporated. Pour remaining cheesecake batter on top of the sugar cookie crumbs. I like to spoon it out to make sure I cover all of the crumbs with cheesecake. Sprinkle the remaining sugar cookie crumbs on top of the cheesecake batter. Bake until the sugar cookie crumbs are golden brown and the cheesecake jiggles like jello. Can I use a 9-inch springform pan? 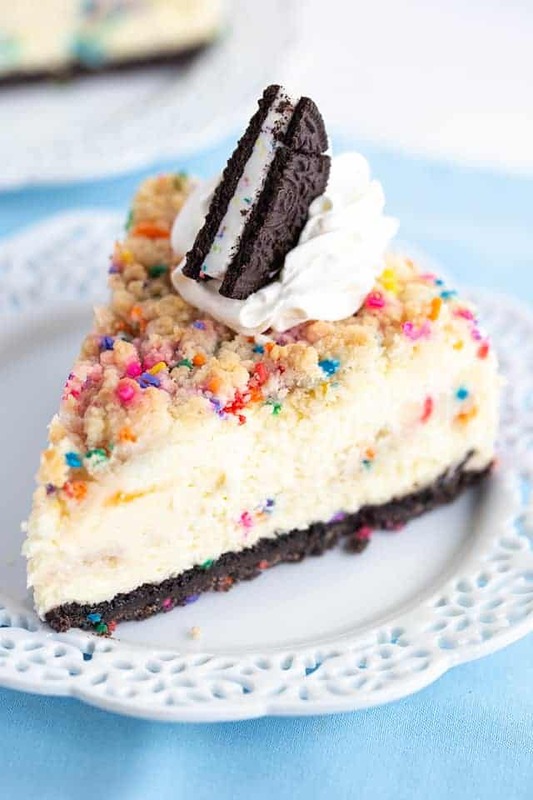 Yes, but some of the sugar cookie crumb might push over the top leaving the cheesecake looking like a mushroom. What was the last thing you ate sprinkles on? Tell me in the comments! In a large mixing bowl, add in the butter and sugar and beat until light and fluffy. This will take about 2 minutes. Add in the vanilla extract, milk, and flour. Beat on medium until the dough comes together and forms a crumble. It should be dry enough that it doesn't actually form a dough ball. Add in the sprinkles and mix until incorporated into the crumb mixture. Place the crumbs into a freezer bag and freeze for 1 hour or more. Preheat oven to 375 degrees. Line your 9.5-inch springform pan with a piece of parchment paper. To get the parchment paper to stick to the sides, I usually lightly coat the sides with nonstick cooking spray. Place the cookies in a food processor. Pulse until the cookies are a fine crumb. You can also place them in a store bag and crush them with a rolling pin. Pour the melted butter over the cookie crumbs and pulse until the crumbs are coated with butter. Add in the sprinkles and stir. Press the cookie crumb firmly into a 9.5-inch springform pan. Place into the oven and bake for 10 minutes. Remove and let cool. Wrap 2 pieces of heavy duty tin foil around the outside of the springform pan. This will help prevent water from getting into your cheesecake. In a large mixing bowl, add in the cream cheese and sugar. Mix on medium until smooth. Add in the vanilla, cake batter extract, and the eggs one at a time. Mix each egg until incorporated and then add another. Scrape the bowl to get any unmixed in cream cheese. Add in the sour cream and heavy cream and mix on medium until combined. Pour 1/3 of the cheesecake batter into the crust. Add in a little more than a third of the cookie dough crumb. Make sure there's enough to cover the cheesecake layer. Pour the remaining cheesecake batter on top of the cookie dough crumb. Carefully place the remaining cookie dough crumb on top of the cheesecake batter. Place a larger pan than the springform pan (make sure the springform pan fits inside of the larger pan) on the top rack of your oven. Pour about 1-inch of hot water in the pan. Place the springform pan inside of the larger pan. Let the cheesecake bake for 1 hour and 20 minutes. To tell if the cheesecake is done, give it a wiggle. If the center jiggles like jello and the outer edges look set, it's ready. Turn off the heat and crack the door of the oven to let the cheesecake cool completely. I normally leave mine in there for about 2 hours. Refrigerate for 6 hours or overnight. Place the 1/2 cup of sprinkles on a plate. 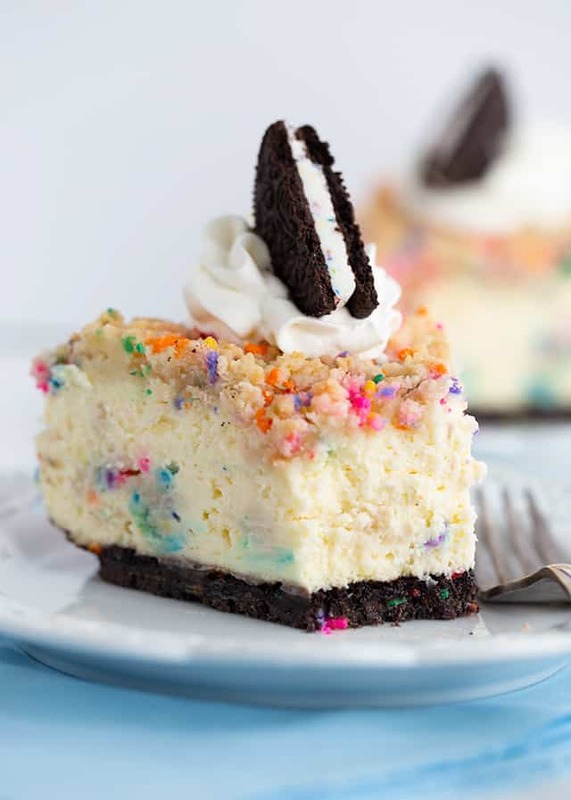 Scoop up handfuls of sprinkles and place them on the side of the cheesecake. Give the bottom of the pan a tap to remove any excess sprinkles. Place the cheesecake on a serving plate. Place the heavy cream in a large bowl. Whip on medium/high until the cream forms soft peaks. Add in the powdered sugar and beat until the whipped cream forms stiff peaks. Place the whipped cream in a piping bag with the 1M tip. Pipe 8 swirls on the top of the cheesecake. Sprinkle some of the remaining sprinkles on the tops of each stack of whipped cream. Cut the 4 Oreos in half using even pressure on the knife. I prevent the Oreo's from crumbling by placing my hand across the top of the knife and apply even pressure while pressing down. That prevents most of the breakage. Garnish the tops of stacks of whipped cream with Oreos. This post was originally posted on March 18th, 2015. Thank you! Cheesecakes are so fun to put together! I love this idea and it looks amazing! Hi Monica! Thank you and no problem. I would let it cool completely. I normally leave the cheesecake in the cracked oven about 2 hours. I’ll clarify in the directions as well. I hope you give it a try! This is one beautiful looking cheesecake! Thank you! It’s pretty addicting too! Oh my gosh, that’s quite a yummy looking cheesecake! Happy Blogiversary! Thanks Judy! It was fantastic! What kind of butter did u use, salted or unsalted? Happy blogiversary! Your comment about the candle made me laugh. I remember one birthday my husband bought candles for my cake and I kept trying to blow them out and they wouldn’t go out. I said “What did you do buy me trick candles?” And he says “No! I Swear!” Well apparently he didn’t read the pacakge very well because upon closer inspection it clearly said “Trick wicks” 🙂 We still laugh about it to this day! Thank you! That’s so funny! lol These had to be something like that too. Hands down my favorite part of this is the sugar cookie crumble on top. Yum! Thank you! I don’t know if I could pick out the favorite part for me. It was sooo good! What a gorgeous little dessert! Happy 2 year blogiversary, girl! Hi Miranda! This cake looks pretty amazing. The colors are so gratifying. I do believe that this tastes delicious. Just looking at the ingredients, I’m sure I’ll be addicted to this! Thank you, Maureen! It was so darn good. Hey! 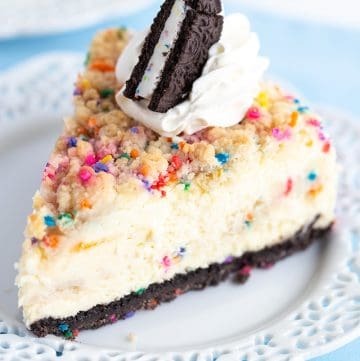 This cheesecake looks absolutely amazing! I plan on making it for my son’s birthday but just wanted to double check with the amount of cream cheese needed. Do I use 3 (8oz) packages or just a total of 8oz? Aww thanks! You’ll want to use 3 (8 oz.) bricks of cream cheese. I don’t have a 91/2 inch springform pan, is 10 inch acceptable. Thanks.